Persons with Centaur Moons and Ascendants–and those with prominent Jupiter aspects, often show the mannerisms and gestures of Sagittarius. 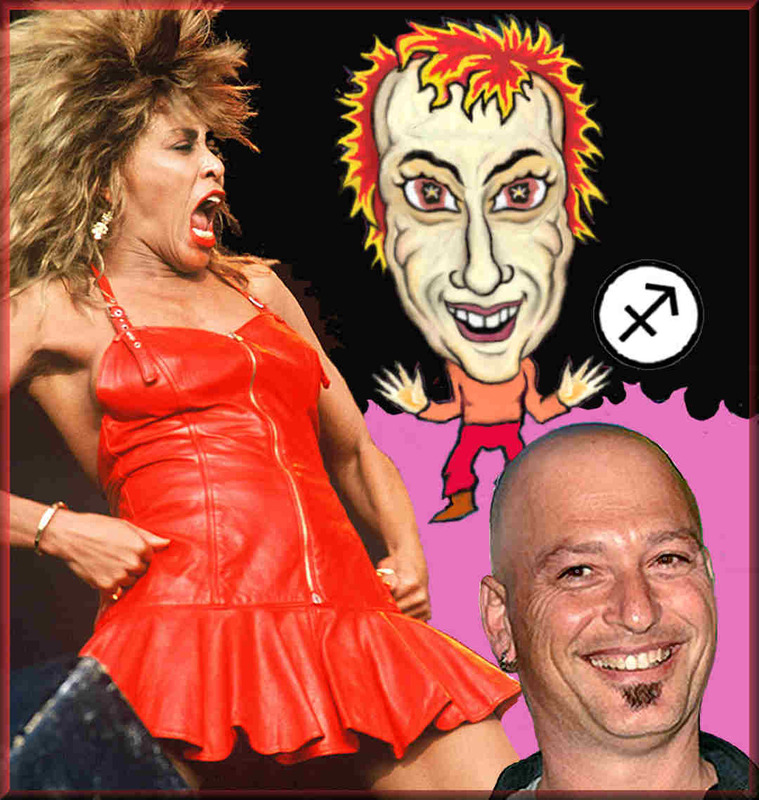 Tina Turner and Howie Mandel display the mannerisms and gestures of Sagittarius. In their actions, the scattering force of Mutable Fire runs in a circulating Mobius-shaped pattern. It can be seen in the crisscrossing, swirling motion of the Centaur’s arms and legs. These Jupiterian leaps of fire also send one side of the face leaping up far above the other. All of these features seem to be skewed, twisted or set at a peculiar angle by the mutable forces. Watch for the large domed skull, the horse eyes, the wide-bridged nose with the ball on the tip, the long neck and jaw. Other Centaur traits include the broad horse teeth and the unmistakable sparkling “horse eyes” that seem to wrap to the side of the face. Appropriately, many of these creatures often sport a pony tail. This collage of facial photos shows how Mutable Fire keeps these Centaur’s energy in a perpetual mix! Here, we will also show how their different astrological components alter the personality and physical attributes of each of these celebrities. find your path of bliss. In this collection of six Centaurs, Brad Pitt, Jon Stewart and Bette Midler (more than the others), display the physical traits as well as the fiery mannerisms and gestures of Sagittarius. This is due to the extra fire in their charts. Brad has a Sagittarius Ascendant. Jon has a Centaur Moon and Bette’s Ascendant is fiery Aries. Stewart and Midler are the “clowns of the zodiac”, who desire to horse around and create joy, laughter and silliness. Brad’s Capricorn Moon gives him a grayer disposition. Jeff Bridges’ fires are fed and stirred by his expansive Gemini Moon, and then grounded by his earthy Virgo Ascendant. With three mutable key components in mutable signs–and an earthy rising sign to anchor the mutable lines in his face–Jeff projects the strongest mutable image of the lot. Like Bridges, when Taylor Swift and Miley Cyrus are not on stage, they show little of the scattered and restless energy of Mutable Fire– for both of their Suns are the only fire in their charts. Notably, both have passive Moons and Ascendants. Taylor’s Moon is in Cancer and her Ascendant is Capricorn. With these cardinal lights, her emotions are fully exposed for the world to see. In contrast, Miley’s Moon is in Scorpio, and her Ascendant is in fixed Taurus. Miley’s emotions are protected and often hidden.